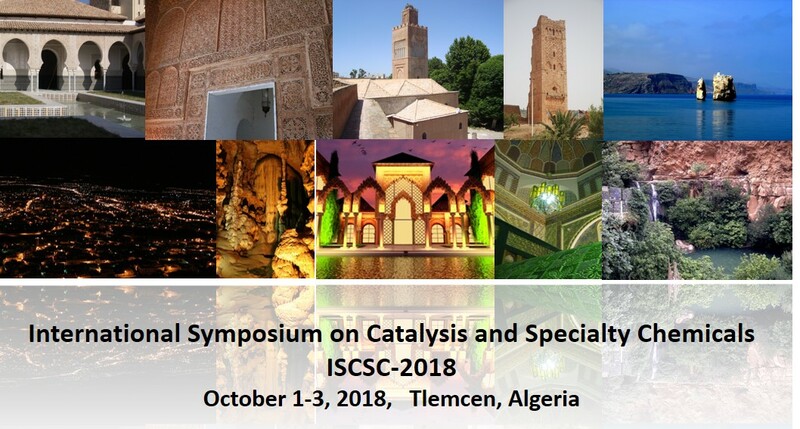 We are delighted to announce the International Symposium on Catalysis and Speciality Chemicals ISCSC 2018 to be held in Tlemcen, Algeria from October 1-3, 2018. The symposium aims to provide a platform for scientists, researchers, academicians as well as industry professionals from all over the world to present their recent research results and development activities in the fields of catalysis, clean energies, environment and all useful materials and chemicals developed in the spirit of green chemistry. The scientific program will include plenary and keynote lectures, oral presentations and posters. We invite you to contribute and enrich the discussions by submitting your recent results to ISCSC 2018. Prizes will be attributed to the Ph-D students best presentations. The symposium official language is english. The 2nd International Symposium on Catalysis and Specialty Chemicals ISCSC-2018 is organized by the Laboratory of Catalysis and Synthesis in Organic Chemistry LCSCO.